Missouri’s newly elected Republican Gov. 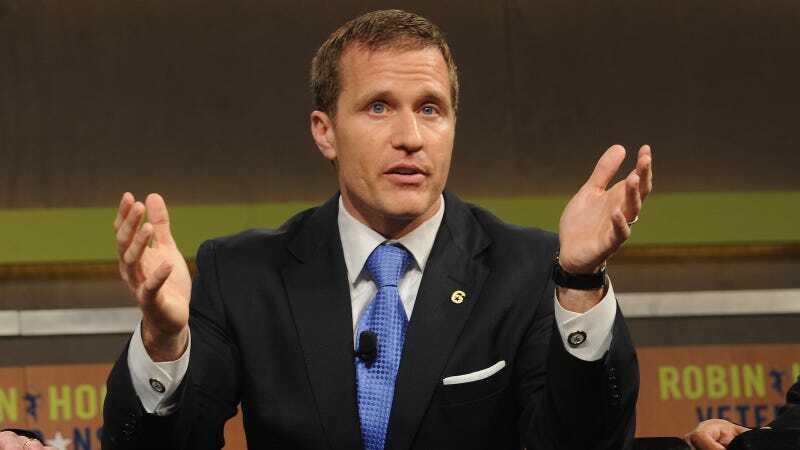 Eric Greitens, who ran in part on a platform of family values, on Wednesday admitted to having an extramarital affair three years ago with a married woman, but denied allegations that he blackmailed her. He assumed office last January. St. Louis network KMOV News 4 first reported the allegations after obtaining a tape in which the woman apologizes for having a sexual relationship with Greitens to her now ex-husband. The woman cut Greitens’s hair and immediately “had a big crush on him.” The flirtation escalated into a meeting at his home, she said. “I was just numb. I just stood there and didn’t (expletive) know,” the woman said. The woman reportedly went on to say that Greitens later apologized to her for the incident and deleted the photo. The ex-husband, who has not been identified, told News 4 that he is coming forward now because law enforcement officials and the media have started contacting him. “Something happened, churned this, and had people hounding me, even leaving a voicemail on my daughter’s phone—when that happened, everything changed,” he said. The woman has not commented on the report. “He took a picture of my wife naked as blackmail. There is no worse person,” the woman’s ex-husband said. In the recording, the two attempt to reconcile, but the woman allegedly continued a relationship with Greitens. The couple divorced in March 2016. Correction: this article previously stated that Greitens assumed office on Tuesday. It has been updated to reflect that he assumed office January 9, 2017.